There is a big scare that is looming large over our heads and this is that, the fossil fuel reserves are fast depleting and sooner rather than later we would need to find a viable alternative and make the switchover. And so, researchers the world over are trying to find out alternatives and come to a conclusion as to what works the best. In their attempts to run cars on alternative fuel, some of the giant automakers both from the United States and Japan have already embarked upon plans to produce hybrid cars that can run on ethanol as well as through electric motors. And a few prototypes have already hit the market and have received general approval too. Some even use PV cells to charge the batteries that activate the motors. So we can say that there has been some development in this field. However, none have so far thought of running a car with wind powered electricity. Nevertheless, the concept is here now and is being discussed in detail. Wind electricity powered cars may be divided into two distinct groups, namely those that are purely EVs or electrical vehicles fitted out with powerful induction motors that are run through a battery bank. As for charging the batteries at regular interval, roadside wind power stations will be provided for the convenience of the car owners. Not unlike numerous gas filling stations found everywhere, these wind power stations will be responsible for instantly charging the car batteries at usual cost. Since the mileage available per charge will be predetermined, it would pose no problem with the drivers as to when the next charging will become due. Of course, this will become practicable only when the entire country will be dotted with Wind Power Service Stations. But this is what is happening right now and we can expect that as wind power slowly becomes extremely popular, this will be possible one day. Thus wind electricity to power cars certainly seems to be possible. And the best news is, since cheap power is a reality, driving around in these vehicles will also become a much more affordable proposition. However, the other type is more complex in construction though the biggest advantage with this type is that they are self-charging and so not dependant on any form of service station. A prototype model of this ingenuously developed car has a 285 horsepower AC electric motor that will initially propel the vehicle via Lithium-Phosphate batteries which can be charged through solar paneling mounted on the body of the vehicle. The body and the frame of the vehicle have been kept as light as possible in order to minimize the power requirement to let the car move. Now let us take a look at how the wind electricity to power cars methodology will function. Once the car is moving, its forward acceleration will activate air intake into two ducts, one in the front and the other in the rear. The frontal air intake duct will house two high revolution wind turbines while the rear air intake duct will have a single powerful wind turbine. The turbines are connected to specially made heavy load capacitors that will store the charge generated by the turbines and release the same to the motor as and when situation demands. The air from the frontal duct will exhaust through the wheel well of the vehicle while the rear intake duct will exhaust through an exhaust port located at the rear of the vehicle. Though wind electricity to power cars has not become a reality today yet, but cheap wind power for your home is already spreading all over the US and in other parts of the world. And why not, after all, there are tremendous benefits of this safe and clean energy that include both financial as well as ecological. 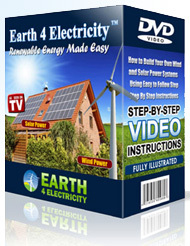 Did you know that you can now have your own personal wind power system? Yes you can now build your own wind power system – but you will need information about where to set it up in your home, how to do it and wire the system, where to get the parts from and also the safety precautions. Here is a manual that will show you all this step-by-step.